Cheltenham Gold Cup heroes Sizing John and Coneygree will lock horns in Wednesday's Coral Punchestown Gold Cup after the pair headed six declarations on Monday morning. 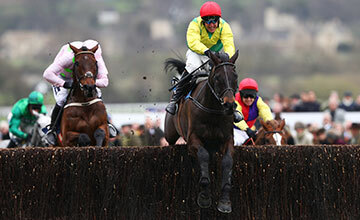 Sizing John handed the red-hot Jessica Harrington and Robbie Power combination a first Timico Gold Cup at Cheltenham last month, a race the 2015 winner Coneygree missed following his only start of the season when second to Cue Card in the Betfair Chase at Haydock in November. The two stars lead the way in a strong line-up, with two-time Cheltenham runner-up Djakadam and Thyestes winner Champagne West also standing their ground. Flemenstar and Outlander complete the field. Sponsors Coral make Sizing John the 11-10 favourite to complete the famous double, with Djakadam at 5-2 and Coneygree an 11-2 chance. Elsewhere at Punchestown on Wednesday, a pair of Cheltenham Festival winners will clash in the Grade 1 Irish Daily Mirror Novice Hurdle with Albert Bartlett winner Penhill taking on the impressive Pertemps scorer Presenting Percy. The pair are among eight declarations for that race, while Cheltenham Champion Bumper winner Fayonagh heads seven for the Grade 1 Punchestown Champion INH Flat Race.